"If Big Brother saves lives," says Florida's Palm Beach County Commissioner Burt Aaronson, "then I'm happy to be Big Brother." One of the foremost advocates of traffic safety has withdrawn support for the District of Columbia's traffic camera enforcement program after city officials conceded revenue was a primary motivation. The Automobile Association of America (AAA), which supports the use of traffic cameras to enhance road safety, has rebuffed the city's plan to expand the program to earn more revenue. 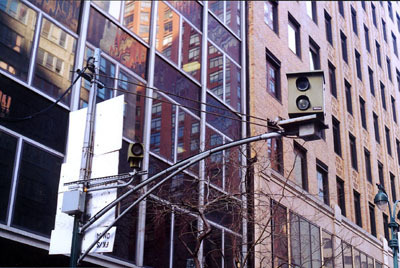 The Metropolitan Police Department collected $18,368,436 in fines through August 2002 with the automated red-light enforcement program, which was implemented in August 1999 to combat "the serious problem of red-light running." "There is a mixed message being sent here. When using these cameras you should not have a vested interest in catching one person running a red light or speeding," said Lon Anderson, spokesman for AAA Mid-Atlantic. Mr. Anderson said that AAA brought attention to a camera that the automobile association deemed unfair on H Street Northeast adjacent to the Union Station garage exit. The camera was affixed at a location on a declining hill with a flashing yellow light that went to red without changing to a solid yellow. "Drivers didn't even know they were running a light. That camera issued 20,000 tickets before we caught it," Mr. Anderson said. He said the camera also caused its share of rear-end collisions, as opponents have contended since the first few months after the program began. "At the H Street camera, we noticed several near rear-end collisions" Mr. Anderson said. "There have been studies that show that red-light cameras can cause an increase of rear-end accidents, but there aren't any hard numbers yet."